Chûn is the best-preserved example of the class of monuments called variously Quoits, Dolmens or Cromlechs. They are probably the earliest of any of the prehistoric monuments remaining, dating from the early Neolithic period (3500-2500 BC), and were constructed by the early farmers who had recently settled and begun to plant crops and raise cattle. Each group of farmers occupied their own area or territory, and on high ground nearby would construct one of these Quoits. They may originally, or subsequently, have been covered by an earth mound, but the capstone itself may have remained uncovered. At Chûn, part of its kerb remains on the NE side. 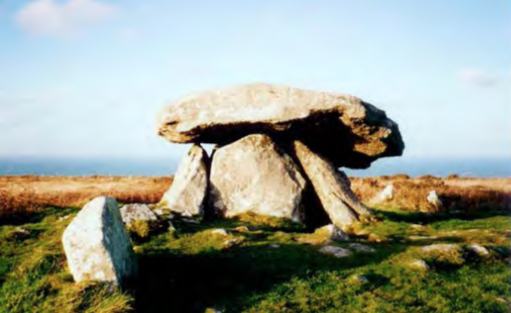 The remaining monument consists of a closed chamber of four slabs 1.5m (4ft) high which lean inwards and support a convex capstone 3.7m (12ft) square and up to 0.8m (2.5ft) thick. The site was dug in 1871 by W.C.Borlase but nothing found. Chûn Quoit (pronounced ‘Choon’) lies on a high spot on the West Penwith moors near to Pendeen. It can be seen clearly on the horizon from the B3318 road that runs from Portherras Cross at Pendeen to join the A3071 road to Penzance. The site can be reached from three directions. One from Keigwin near Pendeen by a public footpath, one from the B3318 road, where there is a small car-parking area and a permissive path that climbs up to the hill, and one from Trehyllys Farm to Chûn Castle. Chûn is a Cornish word, deriving from ‘Chy Woone’ which means ‘The House on the Downs’. The word Quoit comes from the Cornish legend that the capstones on the Quoits came to be there because they were thrown by the giants enjoying a game of quoits. There are a number of quoits (approximately 8 remaining) found usually (though not always) on high ground throughout West Penwith. Interestingly, they are often near, but not on, the tops of hills, and this may relate to the importance for the builders to be able to see the monument from their settlements below. These sites were clearly non-utiliterian, and probably were designed as repositories for the bones of the dead, whose bodies may have been laid out on the capstones for the carrion birds to remove the flesh (a practice known as excarnation). Yet it would be a mistake to think of these monuments simply as ‘burial chambers’. The bone evidence from cromlechs in other places indicates that the disarticu- lated bones of a number of individuals may have been placed inside, and from time to time some bones were removed and were replaced by others. We may perhaps rather think of these sites as places where the tribe (or the shamans of the tribe) would go to consult with the spirits of their dead ancestors in trance journeys and altered states of consciousness.